Dimensionality Reduction is the process of reducing the number of random variables under consideration, and can be divided into feature selection and feature extraction. 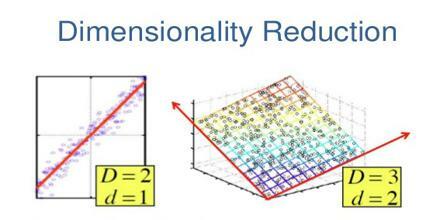 The main linear technique for dimensionality reduction, principal component analysis, performs a linear mapping of the data to a lower-dimensional space in such a way that the variance of the data in the low-dimensional representation is maximized. It is through the use of autoencoders, a special kind of feed-forward neural networks with a bottle-neck hidden layer.